I visited Ireland in 2007 and had an opportunity to try real Irish mushy peas for the first time. 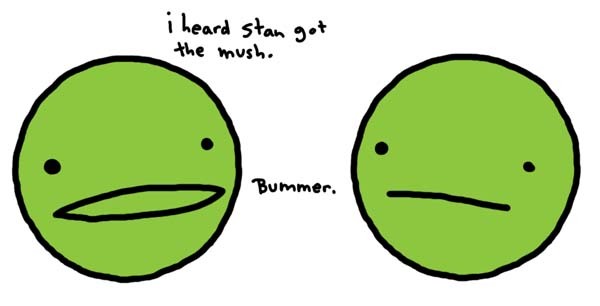 Ever since, I joke with my Irish friends, Laurence and Barbara that the thing I miss most about Ireland is the mushy peas. This week’s share included lots and lots of snap peas, so I decided to try the recipe that Native Offerings Farm suggested on their recipe blog. I don’t know very many people who like mushy peas, so I got to eat them all by myself, and they were GREAT!!! 1. Bring a pot of water to the boil. Add peas and cook for about 3 minutes, or until tender. Drain in a colander. 2. Transfer peas to a food processor or blender. Add remaining ingredients and whizz until puréed–the consistency can be chunky or smooth, your call. Add more cream if needed or desired. You can also just put the cooked peas and remaining ingredients in a large bowl and mash (mush?) them with a potato masher (musher?). Note from My CSA Adventure: I tried the potato musher. No good. A blender is fine.